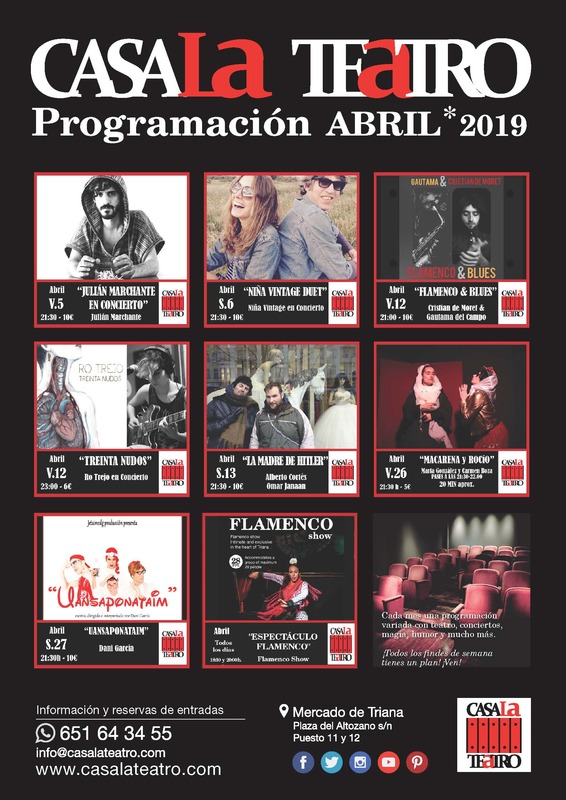 La programación de Teatro en abril en CasaLa Teatro viene llena de conciertos, teatro, comedia con mucho humor so that everyone find their space of culture, art and fun in the theater. HomeWish theater is your theater in Triana so you can enjoy an intimate and different living space shows differently. Julian Marchante (Montevideo / Uruguay / 1987). Today, it has four albums released, “The house plants and time” (with the group “The Roques” / 2008 / MMG), “Half” (2011 / independent) “Heaven for assault” (2012 / independent) and “body outside” (2015 / independent). He has shared the stage with artists like Manu Chao, La Triple Nelson, Four weights Gratuities and Sergio Dawi, among others. From 2010 to 2013 he lived mainly in Spain. Today he lives in Buenos Aires, Argentina. These two connoisseurs of flamenco and jazz artists interact to create a mixed radix musical show with folk poetry, influenced by blues, rock and other genres electrical called “Simbiosis´´. Theatre – Comedia / sábado 13 de abril / 21:30 hrs. Hitler's mother is neither theater nor dance and poetry, is a stage work supported by a selection of texts read into a microphone. The texts are self-authored, signed independently by Omar Janaan and Alberto Cortés. Any text that is read has nothing to do with the other. The texts include the main axis of the show. Each time the content changes are made. Hitler's mother is a relief project, experimentation, fun and survival of Alberto Cortez and Omar Janaan. 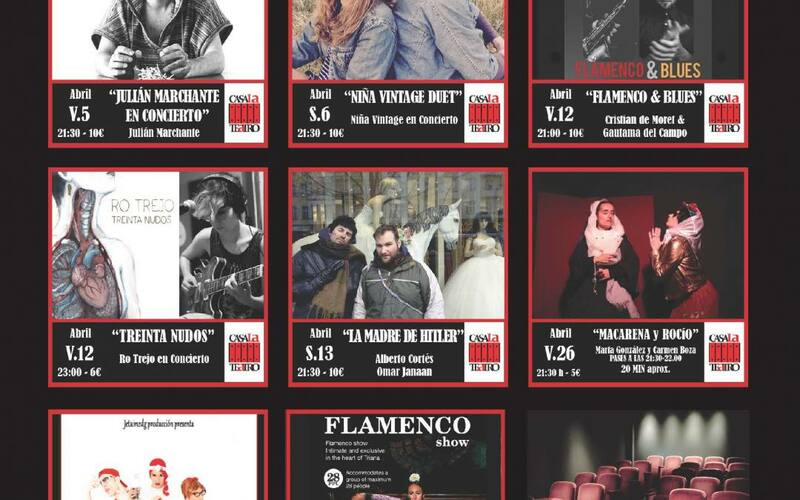 Theatre – comedia / Viernes 26 de Abril / 21:30 hrs. Seville. An altar. A hope. Two virgins trasnochadas willing to break past 100 years. Fashion, technology and finishing touches in surgery, awaken your deepest passions. Andalusian tradition is about to change. A hilarious comedy not stop laughing! Theatre – Comedia / sábado 27 de abril / 21:30 hrs. Who said that Snow White was good and sweet or Peter Pan was green and was flying or children are good and obedient or governesses do not take anxiolytics and sing great? "Uansaponataim" shatters the myths children through four characters who tell us their particular vision of the story and life. All with humor, love, affection and of course, more than one song. A queen who is not willing to that people consider bad, a hero who is more than flesh and blood Madrid stew, a governess with an ideology and a more select methods and a child's neighborhood that slingshot yesteryear. "Uansaponataim" ... was once a funny story, acid where we will be happy without killing partridges. Flamenco / Daily / 18: 30- 19:30 hrs. 20: 00-21: 00 hrs. A flamenco show guitar, sing and dance at HomeWish Theater. This unexpected event for lovers of flamenco born in the theater Triana Market, including vegetables, fish and meat, surrounded by the scent of spices and the sweet smell of fruta.Hoy day, as there is a choreographic flamenco large spaces, we are able to see a great show in an intimate place, located in the heart of one of the most popular districts of Seville: Triana.